The original “Jurassic Park,” now 25 years old, is still remembered fondly and enthusiastically. It is often discussed in effusive terms and frequently considered one of the best Hollywood blockbusters of its decade. It spawned two warmly-received sequels in the ensuing years – in 1997 and in 2001 – neither of which recaptured the magic or the fervor of the original. After 2001, audiences had to content themselves with pleasant re-visitations of the 1993 classic and simply enjoy the wonderment that Steven Spielberg delivered so effectively. 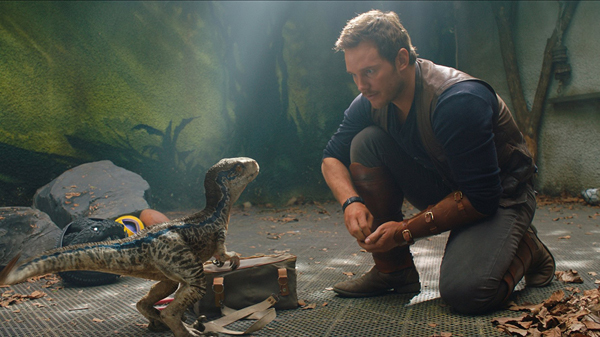 The blindingly powerful success of Colin Trevorrow's “Jurassic World” in 2015 may have revealed that audiences, while adoring the original, perhaps always clamored for something, well, a little different. “Jurassic World” jettisoned the wonderment of “Jurassic Park,” sped up the pace, featured broader characters, and replaced them with more dinosaur mayhem, and more high-concept silliness. Audiences, it seemed, were weary of a thriller about a dozen hapless humans evading dinosaurs through an incomplete theme park. They now wanted the full-scale slaughter of theme park guests and greedy corporate suits at the talons of the monsters. At some point in the last 25 years, the dinosaurs became the good guys. The story, co-penned by Trevorrow, involves the previously-unseen shadow partner to “Jurassic Park's” John Hammond, played by James Cromwell, who enlists activist Claire (Bryce Dallas Howard) and velociraptor trainer Owen (Chris Pratt) to return to the site of the now-ruined Jurassic World to hastily rescue several dinosaur species from a newly awakened volcano. Along for the journey are a comically evil poacher played by Ted Levine, and an immensely appealing, wonderfully sarcastic paleoveterinarian named Dr. Zia Rodriguez played by Daniella Pineda. No points for guessing that Rafe Spall has secretly enlisted Ted Levine and his poachers to kidnap dinosaurs for more nefarious purposes. The first third of “Fallen Kingdom” is a decent and gorgeously staged series of monster set pieces that certainly fulfill one's inner quota for creature mayhem. Director Bayona clearly knows how to shoot monsters for maximum visual efficiency, making threats extra threatening and panic extra panicked. There is a sequence in a sinking bathyscaphe that is amazingly realized, and filmed as well as anything could be in a modern blockbuster. Never mind that the logic of the action is completely absent. “Fallen Kingdom” features a glowing sci-fi super dinosaur clone lab in the basement of a palatial mansion – the place where they make extra-monstrous “indoraptors” – and it looks like something out of the “Teenage Mutant Ninja Turtles: Out of the Shadows.” Which is, for my money, the vastly better film. The expertise of “Fallen Kingdom's” action sequences, however, is not balanced by real humanity – an odd thing to say about a film from the director of the aggressively sensitive “A Monster Calls.” However great the actors are – Howard is a strong screen presence, and Pineda steals every one of her scenes – the characters are intended, it seems, to be supporting players to the dinosaurs. They exist merely to explain what the dinosaurs may be thinking and to streamline the dinosaur narrative into English. It's T. Rex's world, we're just living in it. There is a scant amount of fun to be had in the sheer glorious silliness of “Fallen Kingdom.” I am, after all, an enormous fan of late 1960s Godzilla movies, which were as silly as they came. And, indeed, there are all-too-fleeting moments of creature goofiness that might promise campy transcendence. There is even a moment where a dinosaur smirks to itself before attacking a human aggressor. But the late-'10s Hollywood blockbuster earnestness undercuts any winking playfulness it may have had. “Fallen Kingdom” is yet another example of a previous generation's B-movie making its way onto the A-list, practically wholesale. Anyway, what I find to be lacking in the sequels is not just the wonder of seeing Dinosaurs, but the lack of scientific excitement. The third one tries to walk that ground more so than lost world (which is why I prefer it over 2) but it never fully balances the scientific optimism with the thrilling adventure of a blockbuster. Those are my two cents so what do I know. Half of this movie takes place inside a house. Let that sink in. A 'Jurassic Park / World' movie set inside a house. Yes, it's that bad. And the characters are complete idiots. It's the worst of all these films by far. I hated it. Felt much the same way - moments that were meant to be oh so earnest but I couldn’t help but laugh.